LANE4 Property Group, Inc., officials with the City of Kansas City, MO, and the surrounding community celebrated the ground breaking of the extensive remodel and renovation of the Red Bridge Shopping Center this morning. In front of the future location of Euston Hardware, a former long-time tenant now returning, on the northwest side of the center, the Center High School Band performed to the delight of the nearly 300 people in attendance. The Red Bridge Shopping Center and surrounding neighborhoods were developed by the legendary J.C. Nichols Company, starting in the 1950s. LANE4 purchased the center late last year. “We are excited to update and remodel the property to a level that befits the surrounding quality neighborhoods and schools.” said Brandon Buckley, Vice President of LANE4. “It’s long overdue. Our objective is to bring it back to its glory days when it was the staple of the neighborhood, and all of South Kansas City for that matter.” The center consists of approximately 150,000 square feet and is anchored by Lipari’s Sun Fresh Grocery Market. Since purchasing the center 6 months ago, LANE4 reports that they have secured leases and commitments for over one-third of the existing vacant space, with more tenant announcements expected in the near future. LANE4 was originally attracted to the property because of the surrounding J.C. Nichols neighborhoods, the Center School District, the Saint Thomas More School and Parish, and the proximity to so many major employers including Freight Quote, Burns & McDonnell, St. Joseph Hospital and the Cerner Corporation campus under construction 6 minutes away at I-435 and Bannister Road, projected to employ 16,000 people within the next 10 years. The renovation efforts at the center began several weeks ago and are expected to be completed by October 1st of this year. General contractor, Centric Projects is at work on an extensive overhaul of the façade featuring coastal-inspired architecture, two large tower elements that will open and bring natural light into the key corner restaurant spaces, and a comprehensive new landscaping plan. Additionally, Centric is replacing the main roofs and the parking lots. New lighting and other site amenities will completely transform the center according to Generator Studio who is providing architectural services. LANE4, Centric and Generator also teamed up in 2011 for the renovation of Corinth Square in Prairie Village, Kansas, a similar center also originally developed by J.C. Nichols Company in the 1960s. Euston Hardware: The long time Kansas City family hardware store’s newest location will be in approximately half of the former bowling alley space on the west side of the center. It will consist of 15,000 square feet in addition to an equipment rental and garden center area. Euston staff members pride themselves on outstanding customer service and specialized products. They have 4 other area stores including one at The Village Shops in Prairie Village, another LANE4 redevelopment project. 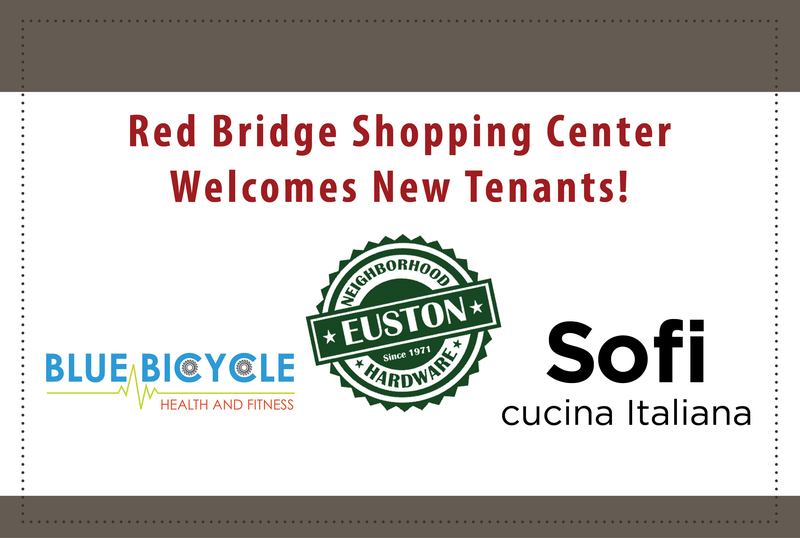 Euston was actually a tenant in Red Bridge from 1985-1997 in a much smaller 5,400 square foot space. They are thrilled to be returning with a full-line store that can better serve the needs of the neighborhood. Euston plans to open this fall. Blue Bicycle Fitness Center: Blue Bicycle is now open after purchasing Bene-fit Health and Fitness and their 6,000 square foot space on the east side of the center. They plan to completely remodel and expand the space to 12,000 square feet in order to offer an array of additional fitness services including personal training and yoga. The business will be owned and operated by Jan Schmidt a well-known local fitness and wellness consultant with a vast résumé, including a tenure at The University of Kansas Medical Center. She is excited to create a dynamic “neighborhood gym” culture that is energized by the relationships among members and staff. Sofi Cucina Italiana Restaurant: This brand new Italian dining concept is the perfect combination of local talent, quality operations, beautiful interior design, and delicious food. The menu will showcase fresh pastas made in-house that will be featured in both classic and modern Italian dishes. Sofi is currently in the design stage and hopes to create a unique, family-friendly, Mediterranean atmosphere in the 5,000 square foot former Bruce Smith Drug Store on the north side of the center. Sofi anticipates an opening in the first quarter of 2017. Chef Alex Staab is teaming with Back Napkin Restaurant Group, a locally owned enterprise headed by Bret Springs and Zach Marten. Back Napkin brought Coal Vines to the Country Club Plaza and has since created two other successful restaurants: Westport Ale House, and RND Corner Grill which opened several months ago in downtown Lawrence, Kansas. ABOUT LANE4: LANE4 Property Group specializes in project leasing, tenant representation, development and property management of retail, office, hospitality and mixed-use projects throughout the Midwest including 39Rainbow in Kansas City, Kan., The Village in Prairie Village, Kan., Corinth Square in Prairie Village, Kan., Mission Crossing in Mission, Kan., One Kellogg Place in Wichita, Kan., The Shoppes at Market Pointe in Papillion, Neb., Northwood Shopping Center, Kansas City, Kan, Sporting Park, Kansas City, Kan, The repositioning of Bannister Mall into Cerner Corporation Campus, Kansas City, Mo and Tiffany Springs MarketCenter in Kansas City, Mo. For more information on LANE4 Property Group, visit www.lane4group.com . ABOUT X TEAM INTERNATIONAL: LANE4 is a proud member of X Team International, a leading retail real estate brokerage alliance serving the world’s premier tenants, landlords, developers, owners and third party service providers. Comprised of industry professionals from small and mid-sized boutique firms who average more than 20 years of experience, X Team International has proven expertise in more than 45 major markets, and partners located in some of the largest cities throughout the U.S., Canada and Europe.